Here we are at the business end of the MX Nationals season, and what a cracker it’s been. We’ve witnessed some great racing across all three of the main classes in a variety of weather conditions (except heavy rain, thank God!) and a huge range of track surfaces. Seeing the emotion behind Luke Styke’s MX2 championship win on Sunday at Toowoomba’s penultimate round of the Monster Energy MX Nationals really displayed what it meant to the team. On paper, it looked relatively easy, but in terms of hard work and effort that’s gone into winning the title, it’s been unrelenting. 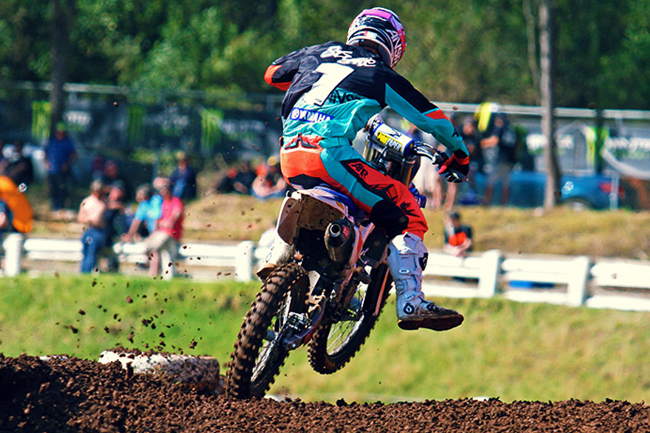 When Styke fell two points short of the title in 2012 after leading in the early stages, the team was always going to be determined to bounce back this season. Experienced campaigners like Josh Cachia and Kade Mosig may have bowed out through injury, however Kale Makeham, Brock Winston and co definitely kept the pressure on. It’s a good time for Serco Yamaha right now because while Styke is determined to head to Europe and score a grand prix gig, the Queensland-based factory Yamaha team has Luke Clout waiting in the wings and a brand new YZ250F ready to be released for 2014. Who they’ll sign to replace Styke next year is anybody’s guess! Earlier this morning MotoOnline.com.au in conjunction with Serco Yamaha and the team’s associate sponsors launched a neat Instagram contest where fans can win a Styke replica set of ANSR Alpha gear. Click here for details how you can win. Styke’s MX2 title has been the product of plenty of hard work and dedication from both rider and team. Image: Simon Makker/Makkreative.com. As Coolum approaches this weekend, it’s Matt Moss’ title to lose in MX1 and same goes with talented Kiwi kid Hamish Harwood in MXD. Moss has a 25-point advantage over arch-rival Todd Waters at this point, however as we know, it is the final round and anything can happen. Moss was his usual solid self at Toowoomba, most consistent of the bunch even if the times were exceptionally close throughout qualifying. Waters meanwhile wasn’t quite on par, struggling somewhat with the hard pack conditions that he wasn’t expecting on race day. This weekend you can expect Waters to come out firing, but will it be too little, too late? As for Moss, it will be interesting to see if he backs it down a notch and goes into conservation mode, or if he’ll go for the championship in style with a win. One to watch will be Waters’ teammate Kirk Gibbs on the second of the Motorex KTMs. He has confidence on his side after that moto two win at Toowoomba, and word is he was absolutely ripping at Coolum recently while training. If he lands on the podium this weekend it will be five from 10 for the season, so a 50 percent strike rate of top three results would be a strong, strong result for the rookie. It’s one of the busiest times of the year right now as teams finalise their MX seasons while also preparing for the Supercross series, which starts in just over a fortnight at Darwin’s Hidden Valley Raceway. The question is, who will be prepared best come the opening round? Top Image: The Coolum finale is sure to be evenly matched between the top MX1 combatants. Image: Simon Makker/Makkreative.com.